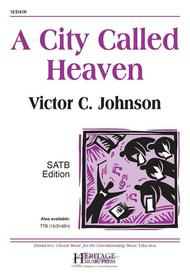 A City Called Heaven composed by Victor C. Johnson. For SATB choir, piano. Concert, Festival. Octavo. Published by Heritage Music Press (LO.15-3141H).A soulful, reflective, and free-flowing opening leads into an easy jazz-waltz style in this marvelous arrangement. Jazz sonorities abound throughout the piece, and it is suitable for both school and church use.